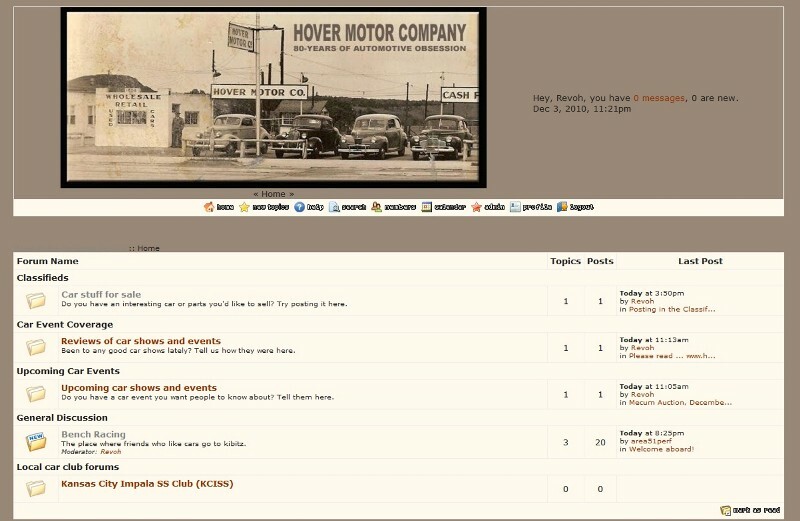 HOVER MOTOR COMPANY: Hover Motor Company introduces a brand-spankin' new messageboard. Free forums for local car clubs! The new messageboard is a place where people can get together, talk about cars, and promote their events. Also, whenever I see something that I can include on the upcoming events calendars I put out on the blog during the summer, I'll be sure to do so. I'm also offering any local car clubs that would like a section on the board their own little sub-forum. Just e-mail me with the name of the club, and as long as it's relevant to Hover Motor Company, I'll set you up. It's not going to cost you anything--no strings attached. I'm just trying to keep people coming back to the blog, and I figure if their clubs have their own section, it gives them a reason to return. As always, feel free to check out the blog, subscribe to e-mail updates, or sign up to the new messageboard. And thank you for your continued readership. I've really enjoyed putting this together this summer, and I hope that comes through in the stories I'm posting. Of course, any comments or suggestions are always welcome!